It was September 19th and the skies were overcast like the congealed neuroses of a suffering city. That city was Memphis, and underneath the covering clouds wandered thousands upon thousands of victims, packing the streets of Cooper Young, blighted with the curse of Partyophilia. The symptoms were heart wrenching: music, revelry, laughter, it was a treasure-trove of billable disorders. And among this human wreckage I, Doctor Harold Toboggans, ventured forth, handing hope to all with the ability to grasp it. “It” being my brilliant pamphlet addressing that horrid condition. Many discerning future patients took the warning to heart, eagerly clinging to every bit of psychiatric wisdom I could spare. Others walked right on by, doomed to wallow in their pitiful joviality forever. Job security, I call it. 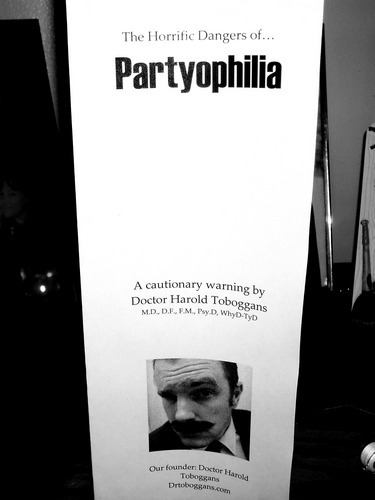 Are you suffering from Partyophilia?